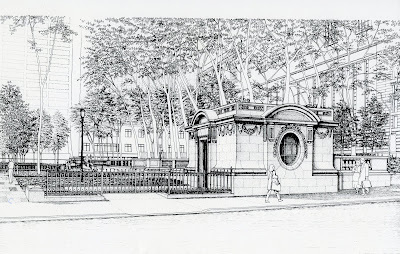 In this post, BPC’s archivist Anne Kumer, shares the history of Bryant Park's restrooms, currently in the running for 2010 America's Best Restroom competition. The tradition of comfort and hospitality is longstanding in Bryant Park. 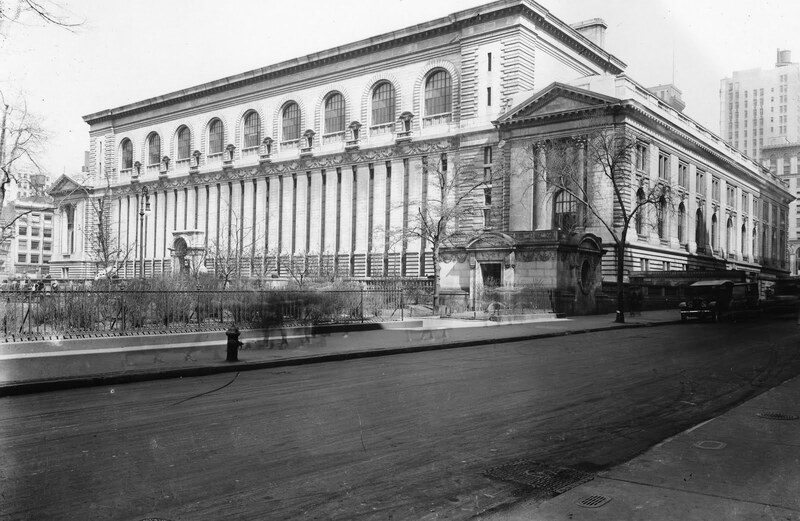 The first restrooms date back to 1911, when the main branch of the New York Public Library was built. Designed by architects John Merven Carrére and Thomas Hastings, the Beaux-Arts building was completed in 1911, with a raised terrace at the rear of the library and two comfort stations at the east end of Bryant Park. These structures originally functioned as two separate restrooms - women’s at 40th street, and men’s at 42nd street. 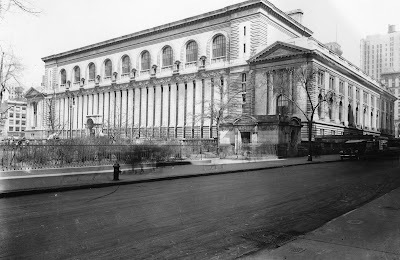 The photo above shows the 40th Street Women's Restroom, and back of the NYPL in the early 1920s. If you look closely, you can also see the ghostly evidence of passerby on 40th Street (the result of a long exposure and slow shutter speed), as well as the William Cullen Bryant monument. The men’s restroom (at 42nd Street) remained open and functional until the 1960s, when it was closed because of disrepair and poor use. 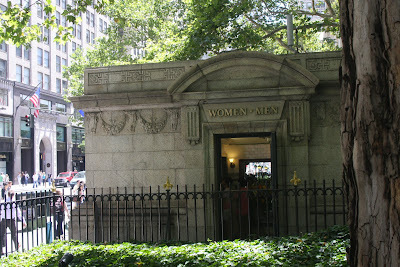 The original women’s restroom (at 40th Street) became the district office for the Parks Department until March 1, 1988, when the Bryant Park Corporation (then called Bryant Park Restoration Corporation) took over day-to-day management of the park. 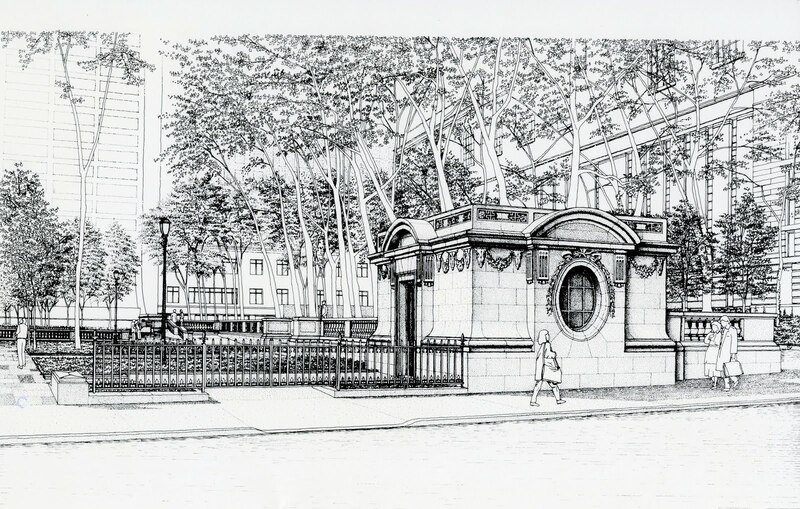 After the Bryant Park Corporation assumed management, the 40th street structure was turned into a storage area/office for park operations. The original men’s room at 42nd street was renovated as a restroom for both sexes. Starting with the 1988 renovation, the restrooms have had full-time attendants. Since then, we have added scented oil diffusers, fresh flowers, modernized the facilities, and even been nominated for America's Best Restroom. Vote for us here. There are only five days left to vote!